Obviously, Stick V9 Max, SMOK's latest pen-style vape with the largest battery capacity to date, has eye-catching outlook and excellent performance, making it stand out among stick series. 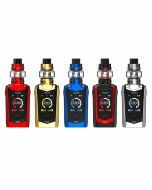 SMOK Stick V8 Kit is an all-purpose platform caters towards cloud-chasing performance. 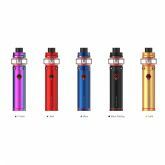 Stick V9 Max kit, a new upgraded version of Stick V8 series, consists of built-in 4000mAh battery and Stick V9 Max tank, which are the best combo either from the appearance or the performance. For the "Max", you can tell from its 4000mAh battery capacity, 8.5ml Eliquid capacity, 16mm V2 Baby exclusive delrin drip tip and its large outside diameter in stick, no doubt, they're perfectly compatible with each other. Stick V9 Max is a power master that employs an unprecedented built-in 4000mAh battery to provide you powerful and durable vaping experiences. With its large capacity, you can enjoy a longtime vaping; what's more, it will bring you massive cloud of vapor. 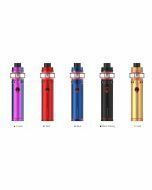 Stick V9 Max tank is the largest tank ever designed by SMOK. Even bigger bulb glass tube. Even larger filling slot that can easily drip e-liquid into the tank. Upgraded airflow system with even wider three airflow slots. There's no need to add the e-liquid frequently, and you can enjoy vaping at ease. Stick V9 Max adopts new powerful coils, Mini V2 S1 coil and Mini V2 S2, both of which are custom-made coils for Stick Series battery. They work at lower wattage but with intense clouds and flavor. Mini V2 S1 coil has mesh inside making a good balance of cloud and flavor; Mini V2 S2 Coil has more restricted airflow, and it possesses longer lifespan due to extra direct wicking channels. 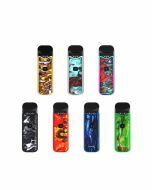 Moreover, SMOK Stick V9 max adopts intelligent LED Indicator. Green Light: above 70% battery power remaining, Orange Light: 30%-70% battery power remaining, and Red Light: below 30% battery power remaining. Besides, the LED indicator will flash 15 times when the voltage is lower than 3.3V. Obviously, Stick V9 Max, SMOK's latest pen-style vape with the largest battery capacity to date, has eye-catching outlook and excellent performance, making it stand out among stick series. You won't want to missing out this excellent starter kit.